“Now, What should I delete?” is a common question arising when Windows says – Disk space full. So, in such situations, Disk Space analyzers come into play and help in decision. Disk scan will reveal the largest file which on deletion will free up few gigabytes. To do that, you should try nothing less than the Best Disk Space analyzer for Windows. Before scanning, you should perform these 5 Steps to Free up Disk Space on Windows so that you get some free space initially. Here are some popular Disk space Analyzers for Windows tested and compared before deciding the best one. WinDirStat allows to make a Folder specific scan, Single Disk Partition scan or even complete Hard Disk Scan. It has a pacman style progress bar while scanning and results are offered in clickable boxes. These colored boxes signifies the type of file and size of file. You can spot the large and get info there itself. Also, it allows to open in Explorer Window. It has a separate option for finding Free Disk space. Classification of colors makes it easy to spot out. Also available as Portable and tiny in size. Scanning took more time compared with others. Graphics could have been made better. Reports cannot be exported for further use. Only option is to mail but unfortunately, I was unable to use that too. Space sniffer will catch your eye at first look. I tried complete Hard Disk Analyzing and results of each drive appeared as explorer window. Graphic representation is easy to read and you will love the click to zoom feature to get more details there itself. Scanning is very fast. Number keeps on changing on screen which makes you feel like something like speedometer. Intuitive and beautiful interface with Explorer like windows inside program. Animations while you move mouse on graphic results. Report can be exported in simple text form. 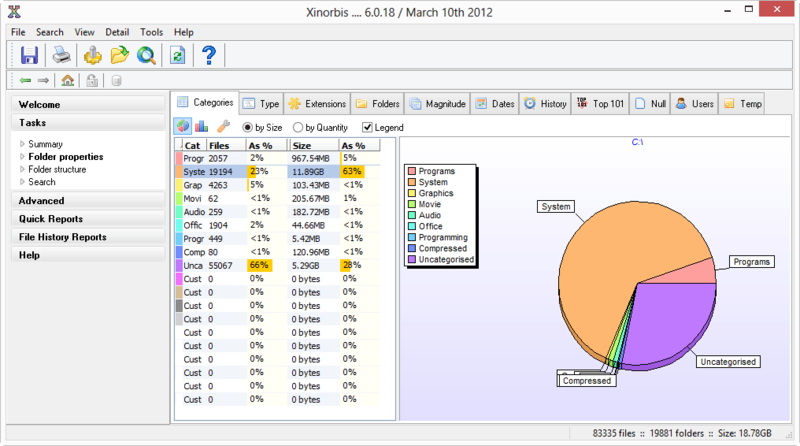 Xinorbis can be called as complete Disk Analyzer program for Windows. The results shown are so detailed and covers each aspect and you can represent the same result different customized ways. Results can be represented in according to parameter you choose. Reports can be exported in multiple formats like Excel Sheet, webpage. More features like finding Duplicate Files in a Drive. Complete Hard Disk Scan isn’t possible. Main motive of Free Disk Analyzer is to find largest file or folder in a Disk drive. Program window doesn’t offer much insights about the detailing apart from filtering type of files whether movie, music, system DLL, etc. Easy to find the largest file / folder eating up the Hard Disk Space. Installer only option is available. I couldn’t find portable version. Bigger in size as compared with other apps above. Not many options or parameters of scanning. Reasons are its portability, ability to scan all drives faster and Representation of data in the manner which most of the users will be looking for. For the geeky ones, I would recommend using Xinorbis as it is versatile and offers result representation in varied parameters with many details. As a footnote- I also tried JDiskReport and Tuneup Disk Space Explorer. Reason behind not including them in the list is that JDiskReport requires Java and only available as Installer type. I am lazy and thought many of my readers won’t like to install multiple things just to analyze disk space. Good thing about Tuneup Disk Space Explorer is its integration with Windows and ability to scan on right click menu. It comes as a part or a module of TuneUp Utilities which is not available for Free download. So, again I skipped it. After analyzing and freeing up space, make sure to follow steps to accelerate Hard Disk Performance. So, I would like to know your comments on deciding the best Disk analyzer for Windows.